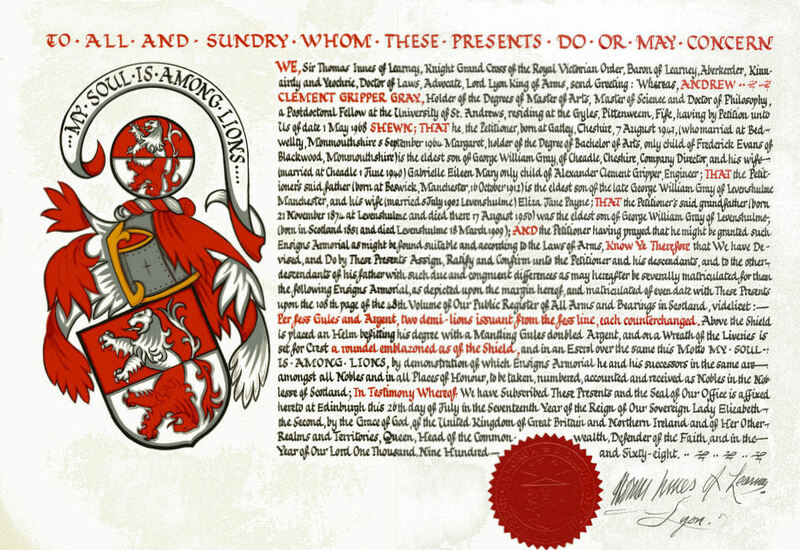 In 1968, while working as a Postdoctoral Research Fellow in my great-grandfather's native land, I petitioned Lord Lyon for a Grant of Arms (below). As an organic chemist with some interest in crystallography, I was intrigued by the use of symmetry operations in heraldic design. My accepted design applies reflection with counter-changing to the arms of The Gray (Gules a lion rampant and a bordure engrailed Argent). See blazon below. Arms: Per fess Gules and Argent two demi-lions issuant from the fess line each counterchanged. [I would have preferred to coin a new term for the symmetry operation: Per fess Gules and Argent a demi-lion rampant mirrored counterchanged].